The churn within the busy compact-crossover field never ends. New models pop up while the segment’s veterans go through necessary rounds of reinvention every few years. Among the vehicles swept up in that process for 2019 is Hyundai’s 2-row crossover SUV, the Santa Fe. The South Korean automaker deserves a lot of credit for substantially improving the Santa Fe. It‘s not perfect, but it delivers good value and utility. The top-line Ultimate trim level comes standard with features such as a panoramic sunroof, satin chrome door handles, hands-free smart liftgate, LED headlights and taillights, and roof side rails. Perhaps the least important yet most visible change to the fourth-generation vehicle is its name. The “short” 5-passenger version used to be known as the Santa Fe Sport. What of the old no-suffix Santa Fe with 3-row seating? It is now billed the Santa Fe XL, and it rolls into ’19 mostly unchanged, marking time until it is replaced by the Palisade for 2020. Of greater significance for people in—or around—the Santa Fe is a broad expansion of standard safety technology. There’s Smart Sense, a grouping that includes forward-collision warning with automatic emergency braking and pedestrian detection; blind-spot monitor; lane-keep assist; rear cross-traffic alert; automatic high-beam headlights; adaptive cruise control; driver-attention warning; and new “Safe Exit Assist” that uses radar to detect vehicles approaching from the rear, and either prevents the driver from deactivating the child-safety locks if the doors are closed or issues a warning if a rear door is already open. Commendably, Smart Sense is built into every Santa Fe, from the SE with a starting price in the mid twenties up to line-leading Ultimates like the one Consumer Guide tested that exceed $39,000. The Santa Fe’s instrument panel is both practical and stylish; most controls are easy to reach and use. The back seat area is large enough to accommodate most adults in comfort. The top three trim levels—SEL Plus, Limited, and Ultimate—also include a parking-distance warning system with rear automatic braking, and “Rear Occupant Alert.” The latter reminds drivers to check the rear row when exiting, but can also detect movement, say from children or pets, in the back seat. If movement is sensed after the driver leaves, the horn will sound and, for good measure, alerts will be sent to the driver’s phone through the Hyundai Blue Link Connected Car system. 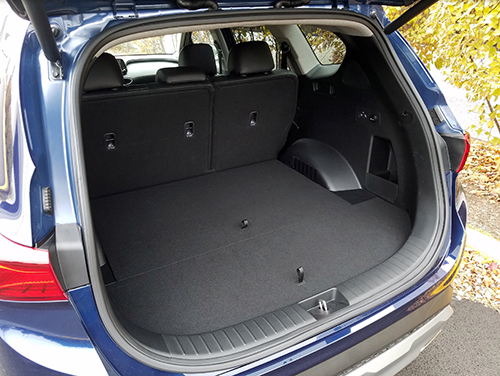 There’s 35.9 cubic feet of cargo space behind the Santa Fe’s second-row seats, and 71.3 cu. ft. with those seats folded–both are competitive figures for the class. 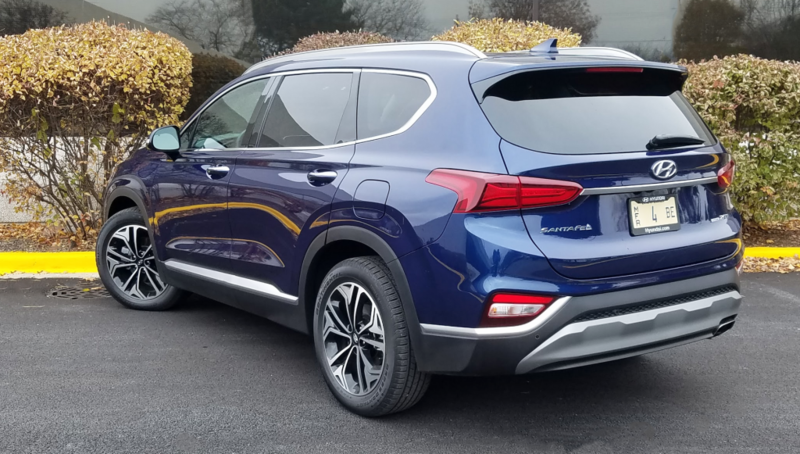 Relative to the former Sport, the all-new Santa Fe gains 2.6 inches of wheelbase, and is longer, wider, and taller overall. Front- or all-wheel drive is available for all five Santa Fe models; the HTRAC torque-allocating AWD adds $1700 to the price. 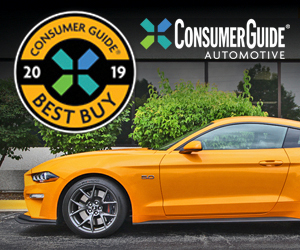 A 185-horsepower 2.4-liter 4-cylinder engine is standard across the board, with a 235-horse turbocharged 2.0-liter four (a $1650 upgrade that includes 19-inch wheels) offered for the Limited and Ultimate. CG’s test Santa Fe Ultimate came with AWD and the turbo mill, and with a set of accessory carpeted floor mats thrown in it totaled $39,905 delivered. 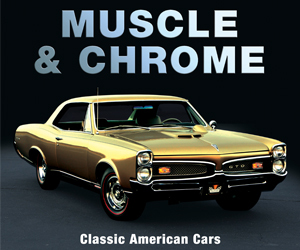 Both engines adopt electronically controlled continuously variable valve timing. Plus, they are joined to an 8-speed automatic transmission that replaces the previous 6-speed autobox. Power delivery from the turbo engine is just all right, not terrible but not stirring, perhaps a textbook example of the concept of “meh.” Even though the torque peak is reached quickly, the turbo Santa Fe doesn’t act like it wants to spring to action when hard pressed. On the highway it can maintain safe speeds, but it works up to them first. The turbo engine does increase maximum towing capacity to 3500 pounds, or 1500 pounds more than is possible with the 2.4 powerplant. The new automatic works fairly smoothly, and kicks down well to do what it can to assist highway acceleration. The turbo engine, which is actually down five horsepower from 2018, is still rated by the EPA at 19 mpg in the city, 24 mpg on the highway, and 21 in combined operation with AWD. In this driver’s experience at least, that seemed pretty accurate: A stint of 175 miles composed of 60 percent city-type driving returned 19.9 mpg. The Santa Fe has one of the subtler stop/start mechanisms, so drivers will likely be more inclined to leave this gas-saver switched on. Hyundai has tightened up the body structure and taken steps to make the new Santa Fe quieter. It rides well with decent bump absorption, and it handles acceptably with a predictable and tolerable level of cornering lean. A “Sport” driving mode ramps up steering resistance a pinch—this tester found it preferable to the base setting. Standard equipment that sets the Ultimate apart from other Santa Fes includes navigation, an 8-inch touchscreen, a 360-degree surround-view monitor, heads-up display, wireless device charging, driver’s-seat memory, front-seat cushion extenders, heated and ventilated front seats, and heated rear seats. Other key included features are leather upholstery, a panoramic sunroof, full LED lighting (including fog lights), dual-zone climate control, 8-way power front seats, keyless entry and starting, and Apple CarPlay/Android Auto smartphone compatibility. 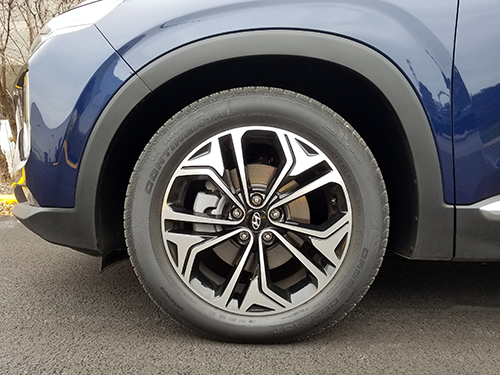 Nineteen-inch alloy wheels are standard on Ultimate models. If not full-on luxurious, there’s still an upscale look and feel to the cabin. Drivers grip a heated leather-wrapped steering wheel and hide-covered shifter. There’s considerable use of padded and soft-surface material (though not on the tops of the rear doors), with a variety of patterns and textures. Driving instruments and the windshield-projected color head-up readout show up big and clear. Audio—a premium Infinity system with HD and satellite radio—is simple to work through the touchscreen. Climate settings rely on dials to select temperature, with buttons (some repetitive-push) for other settings. Fine leg- and headroom is present in both rows. A low floor hump makes it possible to seat a middle passenger in the rear seat, though getting three across might be tight for adults. Rear seats have manually adjustable backrests. Entry and exit are easy, and driver vision only suffers somewhat at the rear corners, where the bodywork makes the typical SUV rise. Interior storage benefits from a huge glove box. The console bears two open cup holders, big bay for wireless charging and device inputs, a small-item bin, and a covered cubby with an adjustable tray for incidentals. There is a storage pouch on the back of the front-passenger seat, and cup holders in the pull-down center armrest. There’s good cargo space accessible through wide hands-free liftgate opening, plus an abundance of small-item capacity under the floor. The rear 60/40-split seats fold just about flat with the cargo floor for expansive capacity, but leave a gap at the pivot point. Because it’s not the most stirring driver, the new Santa Fe’s upper-level models come off as somewhat pricey. But for room, ride, and generally available features, it’s a solid value. 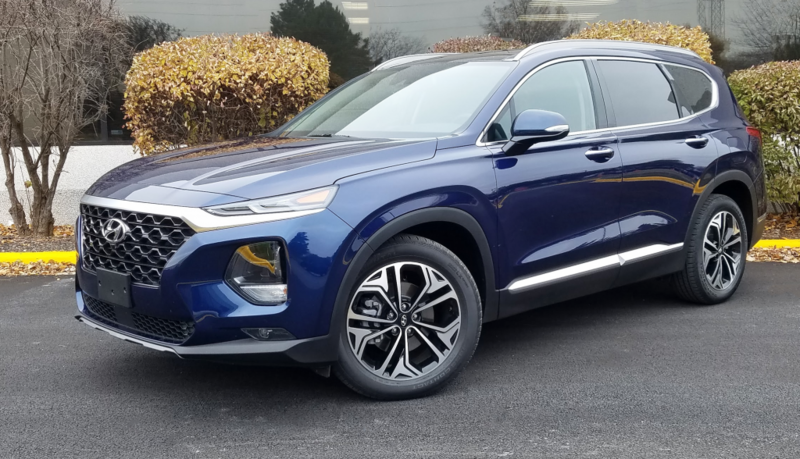 Other midsize SUVs might offer a bit more driving excitement, but the redesigned-for-2019 Hyundai Santa Fe is a well-rounded, family-friendly midsize SUV that offers pleasant road manners, good passenger and cargo room, and a long list of desirable available features, all at highly competitive prices. Written by: The Daily Drive staff on January 28, 2019.